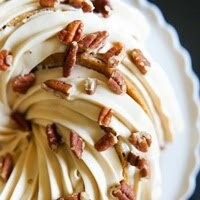 Have you seen these cookie cutters from Williams-Sonoma? These cutters make embossed cookies...they practically decorate themselves! b. do 11-year-old boys really need espresso powder? Now, these cookies are made with Dutch-process cocoa powder which makes them really dark, but I also added in some AmeriColor Super Black food coloring. When tinting dough, just knead in the food coloring with your hands. If the dough gets warm when you do this, pop it in the fridge for 30 minutes or so before rolling. I rolled these out on a surface dusted with a combination of flour and cocoa powder. Don't worry, if you see some on your cookies...it will bake right in. One more tip....once cut, pop these in the freezer for 5-10 minutes before baking to prevent spreading. ...perfectly cute! You really don't need to do anything else to them. But, of course, I couldn't leave well enough alone. I tried Amanda's (from i am baker) cookie decorating icing. I need some more practice with it....mine was a little bumpy and Amanda's never is, but I really liked it. 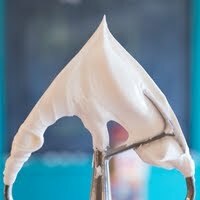 It was shiny, and easy to adjust, and perfect for those times when you don't want to make a big batch of royal icing. 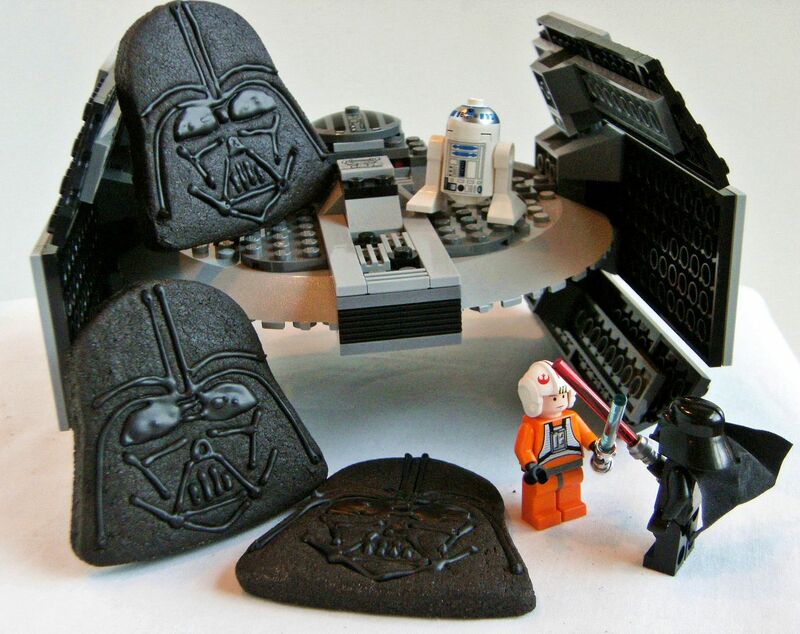 Now that your cookies are made, it's time to break out your kid's Star Wars Legos and have some fun. Yes, we're dorks. Me, I can't decide. I'm torn between C3PO, Yoda and Princess Leia's hair. Come see all the goodies people are loving at TidyMom! LOVE this post. LOVE the cookies. LOVE yoda. I think *even I* could make these??? LOVE them!! I'm not a big Star Wars buff (gasp... I know, it's horrible! ), but I pointed out these cookie cutters to my hubby when we were strolling through W-S a few weeks ago (read: I was strolling, dragging him along behind me). They look fun. 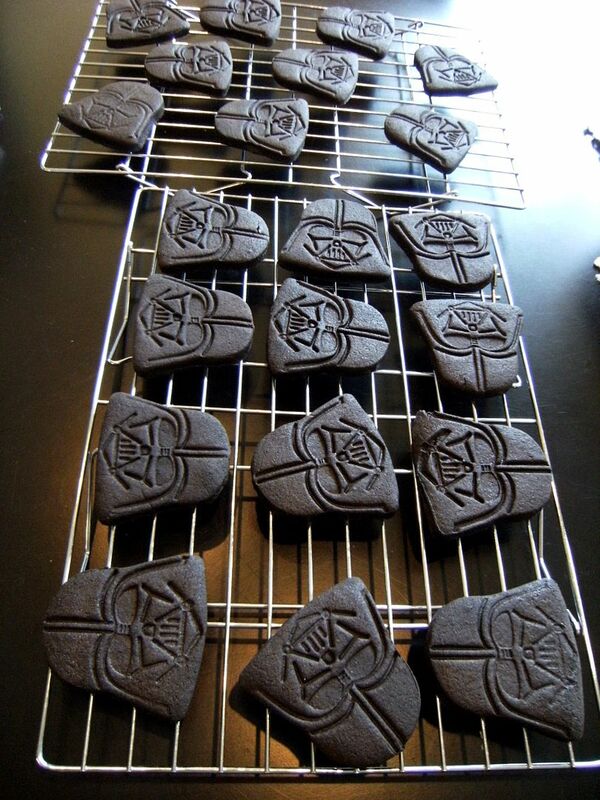 I need to find a Star Wars fan to make these cookies for! Now I MUST try to make black cookies. I have NEVER! But I want to. Well the *Force* was certainly with you when you made these cookies and wrote the post. 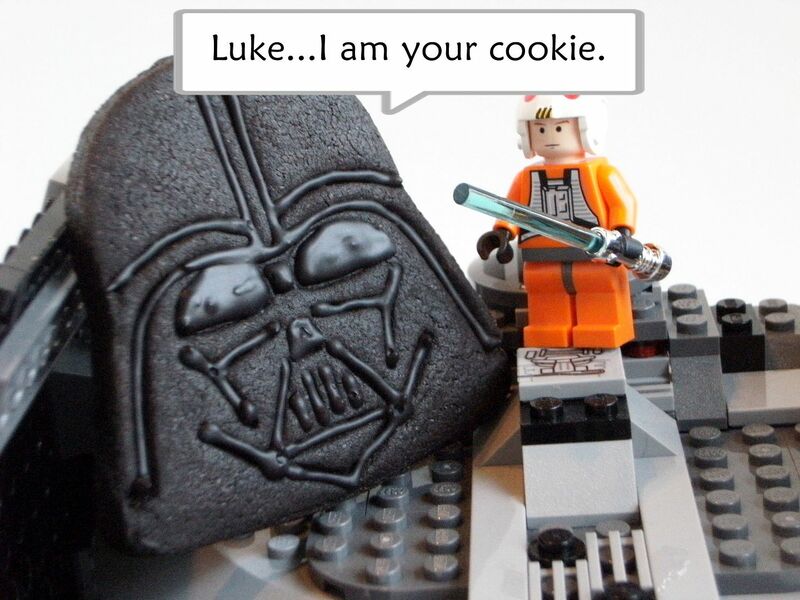 *Luke, I am you Cookie* I'm still laughing. No doubt Kiddo and his pal had a great afternoon playing and then enjoying this snack made by his very special and talented Mom. Girl! Thank you for friending me! I love your site! it is rockin'! 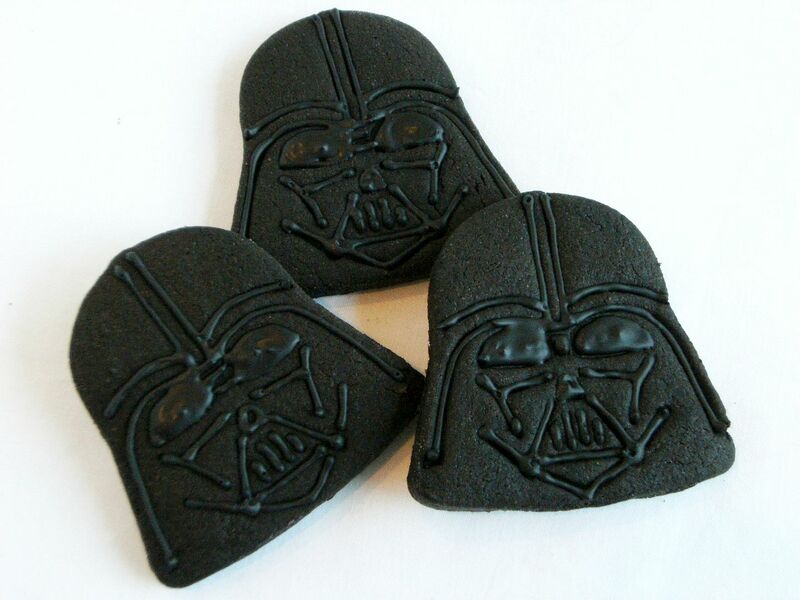 Love the darth cookies. can't wait to see the next post! Such a cute post! I don't know anything about Star Wars (sorry!!) but these cookies are so cute. I love the simplicity. And your Lego pictures cracked me up!! My husband and I found these cookie cutters, and I have never seen him so excited about cookies. Cutest cookie ever! We're Star Wars dorks too and I was even Princess Leia when I was little for a costume party. We also go to Dragon Con every year to "people watch" when they come to Atlanta...good times! These are so cute! Your son and his friends must have been thrilled. I love those cookie cutters. Williams Sonoma has the best things. Oh my these are so cool! My son is 10 and he and all his friends love Star Wars! I am so going to have to get these! You did a fab job! Way to go Mom! Absolutely Awesome! My husband and son are HUGE Star War fans and would love these! Thanks for sharing how you did them and where to buy the cutters! HAHAHAHAHA! Oh I appreciate you! Wow! These are so amazing! I'm am Ewok fan, myself. You crack me up! Those first photos were a hoot! Very cute indeed! And great piping! Those Star Wars cookies are awesome! How do you have time to make all those cute cookies? When I do cookies like this it is a major project and takes me an entire day!! So stinkin cool!!! I want those cutters!!!! 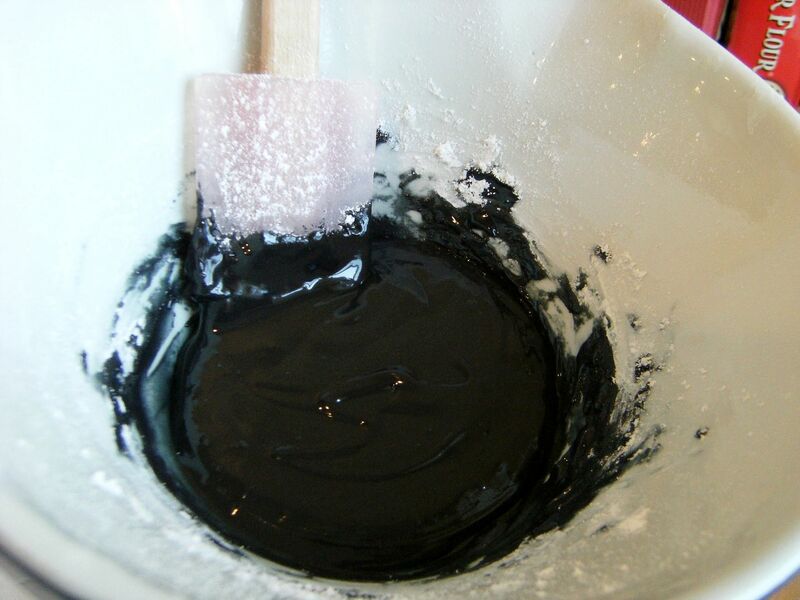 this is such a cool idea to color the dough black! Now i want these cutters too! These are fantastic. I love your photos with the legos. 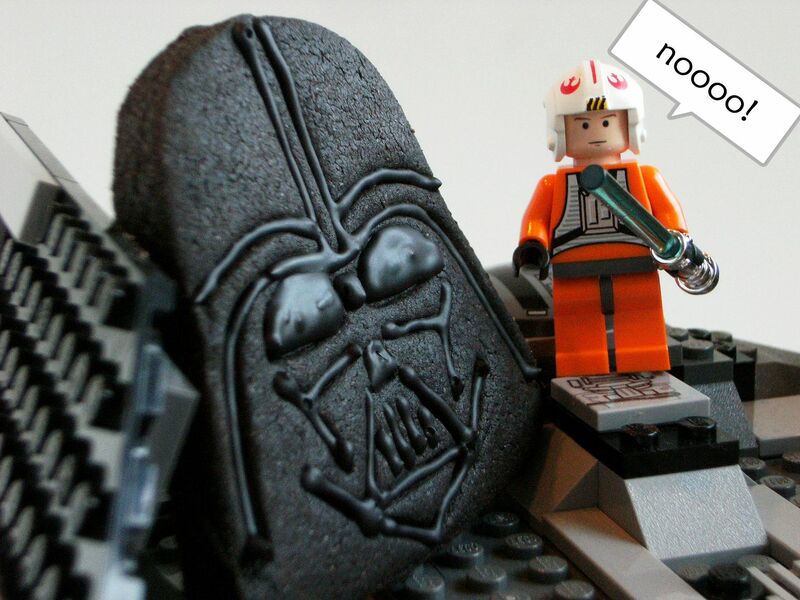 I almost spit coffee on the computer when your blog opened up and I saw "Luke I am your cookie!" BAHAHAHAHA!! you are so funny!! these are so cute, I bet your son's friend thought you were the coolest mom EVER!! Bridget thanks for making me laugh this morning!! These are precious and look so yummy!! Those are awesome! I saw those cookie cutters in the window of the store and thought of you. They should have YOU for their window dressing. You whipped these up for a friend that was coming over?! You've got a very lucky Kiddo. I'll be over next Tuesday. Hehe. These are so fun! Love Star Wars! I bet your son and his friend loved these, they are so cool!! I love how the cookies cutters create the design themselves, brilliant! They turned out fantastic! I'm SOOOO making these! I cannot wait to make some Yoda cookies! @CRAZYMOM - they totally need to come out with some Ewok cookie cutters ASAP. I love it. Chewie's my favorite by far. Ok those are amazing! So cute! Plus...when I sent my mom mother's day cookies she mentioned really liking chocolate (I sent sugar cookies), so for fathers day - planned to send a combo of regular and chocolate - perfect timing! So cute, so fun! My husband would go ga-ga for these, being the Star Wars geek he is. Those look AMAZING. 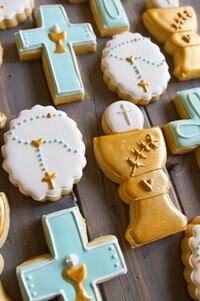 When I saw those cookie cutters I just could not wait to see what all the crafty and baking bloggers did with them. These do no disappoint! 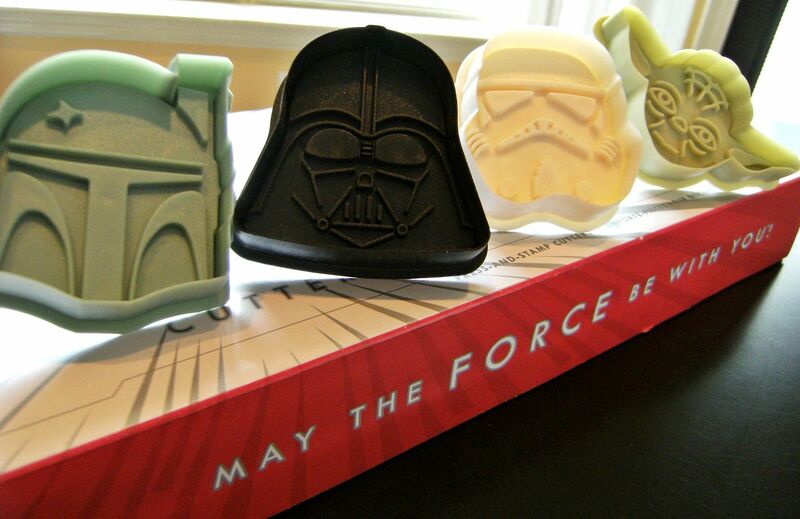 I bought the Star Wars cookie cutters and pancake molds for my husband for Father's Day. (He's a HUGE fan.) 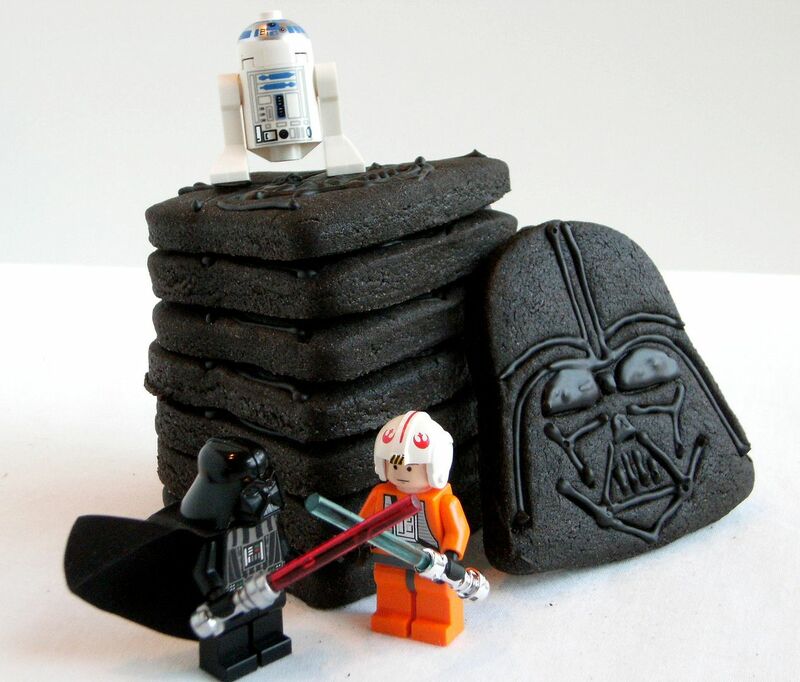 Thank you for this post because now I have cute recipes for the Darth cookies and Yoda pancakes (thanks to Moogie)! As usual, you did an awesome job! 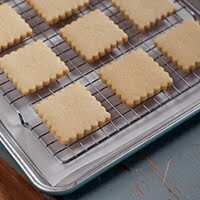 Good tip about popping the cookies in the freezer before baking, I will have to try that next time I am using a fancy cookie cutter! These are awesome! I saw these cookie cutters recently and thought about buying them. I love all the pictures and the lego people are a great touch! This is super cute. 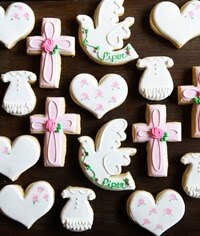 I bet a lot of people would love to receive these cookies-nice! Love, love, love! One of my students gave me a WS gift certificate and I can't wait to get a set of these. What a great way to welcome home my son from Lego Camp next week. Love your pics! I love these cookies! The idea is so new and the concept is fresh! The boys will definitely like this! So absolutely cute!! Gotta get these for my little boy. He just turned 22! You are one cool mom Bridget! These are so fun. We are all about Lego Star Wars in my house too. Never thought I be a lego, or a star wars girl, you just never know what life is going to give you! Hah, Princess Leia's hair :) That's cute. I absolutely love that you kept the design simple and just did icing in the lines! It's wonderful! You have outdone yourself missy! 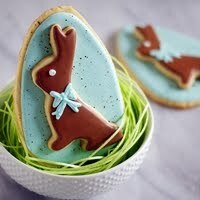 These are the cutest cookies that my big kid (aka husband) would just love. These are so cool! I think I may be have to get some molds now! I made these, too! However, after I realized how difficult it was to pipe/flood them, I decided next time I'm just going to color the cookie dough - like you! Great post. You had to pop up and SURPRISE me with BRIDGET GOES DARTH!!!! Of course YOU would use that scrumptious chocolate cookie recipe...and think to combine flour with COCOA for crying out loud to roll those cute cookies on! Oh I just LOVE Starwars! And it would be a fantasy to give that squishy sweet face of YODA's a big ole KISS!!!! Bridget these cookies are the COOLEST DUDE cookies EVER! And I know your KIDDO and his friends LOVED snacking on them! Oh how I wish you were within driving distance! I'd be popping over with some cucumber dip...on my blog now....and hangin in your kitchen and just watching YOU GO!!!!! Love me some BRIDGET too! My little guy would love these for the Star Wars bday party he wants this year! Forget kids! My husband is going to LOVE ME for these! thank you!!! Haha these are super cupe!!! You are officially the coolest Mom EVAH!!! Now, when I follow these directions, my Little Buddy will think I am, too!!! I HAVE seen these cookies at Williams, and your post is hilarious! 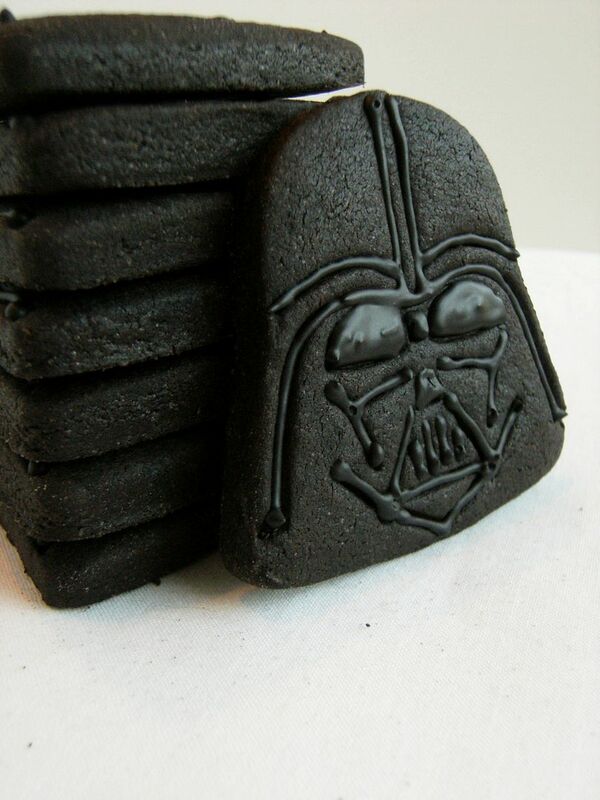 Luke...I am your cookie! Thanks for your great cookie icing tips. I'm also tempted to try those gouda biscotti--maybe with cheddar? By the way, where did you get dutch-processed cocoa powder? What brand is it? They used to sell it at the regular grocery store but I can't seem to find it anymore. Hey Bridget! I just gave you the sunshine award. It's on my blog so come by to pick it up and see the blurp I wrote about you on there. 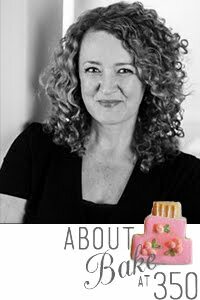 Your blog always makes me smile and drop my jaw in awe of your creations! Bridget, Thanks for all the lovely tutorials in Youtube. I'm going to try my 1st batch of decorated cookies today. I'll see how it goes. For black, in Asia, we have something called the bamboo charcoal which can be added to any kind of dough to be baked, and turn the whole thing black. What more.. it has health properties! Do you want some to be sent to you? If you would send me your mailing address.. I'll see if you can send you some. 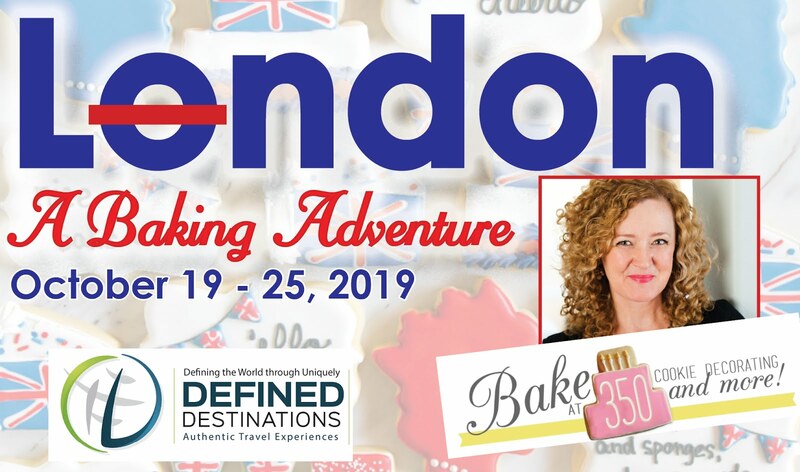 Hi Bake @ 350 - I was wondering if this icing dries hard like royal icing does? I would like to try it. Thanks so much. Wow, you are a genius! My husband insisted I get these because he is a complete Star Wars fanatic. I am a novice at cookie decorating (and most of what I know I learned from you!) and I just about killed myself trying to decorate Vader and the Storm Trooper! Yours are just perfect. Hi Bridget! I have been Talk about this post on my Blog! I hope you enjoy it! cool cookies!! Darth Vader is my fav XD I like the villains. 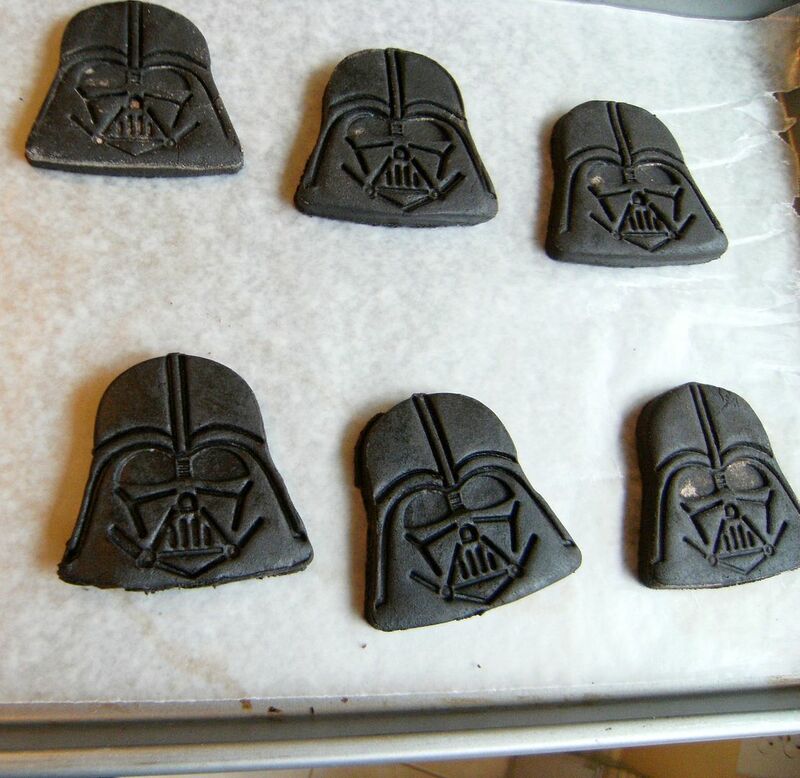 I just had to make Darth Vader for a cupcake and I soooooo could have used the cookie cutters you used...they would have made my life so much easier, but of course I found this post of yours "after"...lol! They look awesome, and I'm sure your kiddo loved them!!! Hi Bridget....I just made these today and while they turned out delicious...they are brown and not black, so I am not sure if I will ice them with black....did you color the dough black? If so, at what stage of the cookie making, and did you use your black Americolor coloring or something different? Thanks for the help! "Now, these cookies are made with Dutch-process cocoa powder which makes them really dark, but I also added in some AmeriColor Super Black food coloring. When tinting dough, just knead in the food coloring with your hands. If the dough gets warm when you do this, pop it in the fridge for 30 minutes or so before rolling." Do you happen to remember how many cookies this recipe made? I am making them for my sons birthday party and we are expecting 40-50 people so wondering if I should double, triple, quadruple?! Most likely to the Charter Spectrum login email account web page TWC login Charter give a webmail service with its Spectrum Web membership bundles. Thank you for the post shared with us. It is informative and interesting. Hope you will keep sharing the nice post with us. Thank you. Frank E. Sumter here, Thank you for the post.